The Star Wars™: Legion Core Set arrives on March 22nd, along with the game's first expansion packs and a Launch Weekend full of exciting activities designed to get you quickly up and running and into battle! That means the weekend of March 22nd to March 25th promises to be an entertaining and memorable event for everyone looking to jump into the Star Wars galaxy's greatest infantry battles, especially for those of you headed to AdeptiCon 2018. AdeptiCon attendees can rest easy—you won't miss out on any of the Star Wars: Legion Launch Weekend activities. You'll be able to participate in all the same activities available elsewhere: the Build & Play, Challenge Duels, and Painting Contest. You will also find a number of Star Wars: Legion events hosted by the convention—two painting seminars, a kickstart event, a Core Set skirmish, and a team tournament. 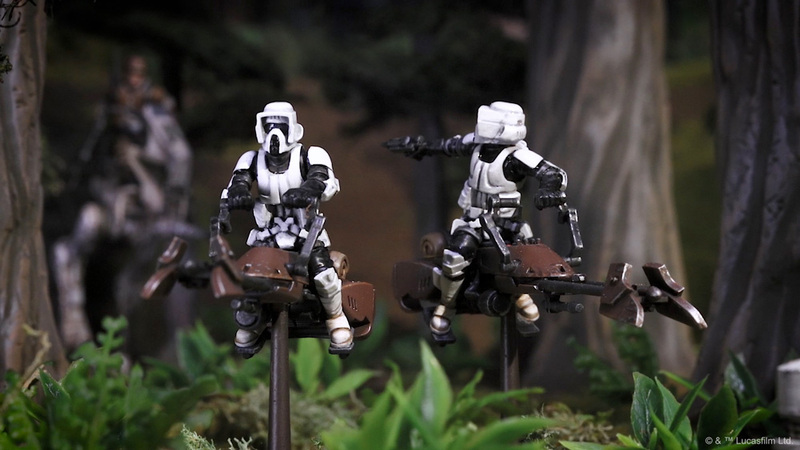 Altogether, these events make AdeptiCon a fantastic place for you to dive into Star Wars: Legion, alongside thousands of other miniatures players and passionate Star Wars fans. Even if you're at the convention for X-Wing™ or one of our other Star Wars games, you can take advantage of the opportunity to see the new game's miniatures and get other players' initial impressions of the game's highly thematic and tactical action. AdeptiCon's Star Wars: Legion events begin as early as Wednesday evening with a painting seminar led by Dave Pauwels and Damon Drescher. This is a hands-on seminar, which means that participants will actually get their hands on some miniatures slightly ahead of the game's official release, and they'll be able to apply the painting techniques they learn immediately as they learn them. Thursday's action opens with a Hobby Kickstart. Participants will assemble their Core Set miniatures and get answers to their questions about the game and the hobby from Fantasy Flight Games staff and AdeptiCon staff. Shortly after the Hobby Kickstart ends, the first battles begin. 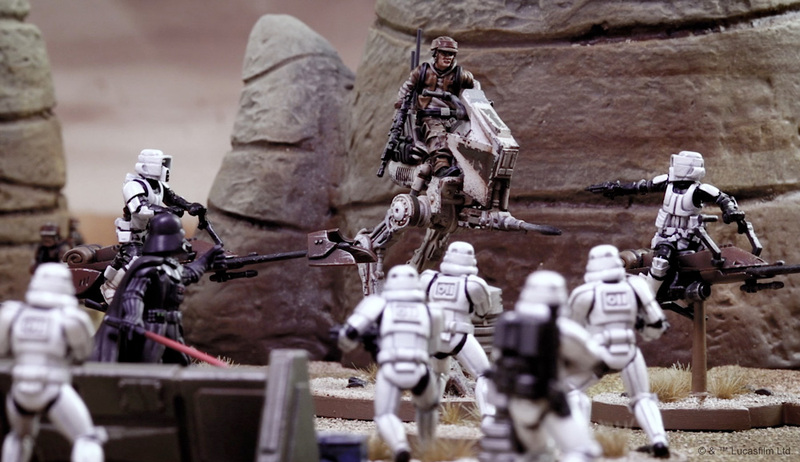 Star Wars: Legion brings the Galactic Civil War to the tabletop in the sold-out Boxset Skirmish, which thrusts Rebel and Imperial forces into combat atop 3' x 3' terrain tables. What's more, the opportunity to incorporate expansion units ensures that the event's commanders will return to their local communities as grizzled veterans, ready to support their troops through the battles to come. For those participants who missed Wednesday's painting seminar, Dave Pauwels and Damon Drescher offer a second session on Thursday evening, and there's a second Hobby Kickstart event on Friday morning. Friday afternoon explodes into action with a second Boxset Skirmish, allowing more players to jump into their first battles. Attendees can pursue an alternate path into the game's infantry battles through the ongoing Build & Play activities, and whether or not you take part in a Boxset Skirmish, you can try your hand in combat with one or more of the ongoing Challenge Duels. These are the same activities your friends will be enjoying back at your favorite local game store, and you can read more about them in our article, "Rally the Troops." Finally, the weekend's infantry battles culminate on Saturday with the Combined Assault team tournament. As Rebels and Imperials clash on planets across the galaxy, players gain the chance to fight a bigger fight. They will band together and fight for a cause greater than themselves. And their battles will become the legends they carry back to their local communities. While the debut of Star Wars: Legion is headlining the Star Wars action at AdeptiCon, it's certainly not the only Star Wars game at the show. There's a full slate of events scheduled for Star Wars™: Armada, Star Wars™: Destiny, Star Wars™: Imperial Assault, and X-Wing. Star Wars: Armada. Armada tournaments on Thursday and Saturday offer fleet admirals a couple chances to prove their worth. Can you anticipate your opponent's traps and counter with your own? Can your fighters effectively screen your ships? Will you fight at range or crash headlong into your opponent's formation? The fleet battles of Star Wars: Armada are big and bombastic, and you can expect these tournaments to be as epic and memorable as the game's Star Destroyers and Rebel cruisers. Star Wars: Destiny. Hundreds of Star Wars: Destiny fans have already made their plans to attend AdeptiCon's Galactic Qualifier. The main event is already sold out in both the Standard and Trilogy formats, and we look forward to learning which heroes or villains are able to rise to the top. Star Wars: Imperial Assault. Fans of Imperial Assault have their chance to combine daring missions and heated battles in Saturday evening's skirmish tournament. Over the course of four rounds, participants will test their tactical mastery, as well as their mastery of the Force and the heavy blaster pistol. Will this be an event dominated by the newly empowered Darth Vader, with his Driven by Hatred upgrade? Will Jabba's mercenaries find their way back to the top tables? Or will the heroes of the Rebel Alliance surprise everyone under the leadership of Ahsoka Tano and Luke Skywalker, Jedi Knight? X-Wing. Squadron leaders attending AdeptiCon can look forward to a weekend full of exciting X-Wing dogfights. In addition to its sold-out System Open, AdeptiCon is playing host to a pair of massive Hyperspace Qualifiers, On Demand Hangar Bay events, and a number of specially formatted events, including a Cadet Academy tournament for players sixteen and under, a Space Race, and a team tournament. With the debut of Star Wars: Legion and all the other Star Wars action taking place on the ground, in starfighters, and aboard capital ships, this year's AdeptiCon promises to be an epic event. If you're going, we hope you enjoy your experiences and carry the energy back to your local play group. If you're thinking of going, be sure to check AdeptiCon's event listing and act quickly—many of these events have already sold out. And if you're not headed to AdeptiCon, visit our list of participating retailers to learn where you can take part in the Star Wars: Legion Launch Weekend activities! Star Wars™: Legion is a miniatures game that invites you to become the commander of an infantry army in the Star Wars universe. Every round, you'll select orders for your units, harnessing your commander's charisma to cut through the fog of war and impose your will on the battlefield. Tactical planning and careful positioning is essential if you're going to lead your troopers to victory!